This website, www.railwayana.com, is presented by Railwayana Auctions UK (RNUK). RNUK was founded by Neil Booth as a company dedicated to helping fellow railway enthusiasts and collectors of railway memorabilia. Neil is a well known enthusiast and collector who has travelled all over the UK many times in search of railway memorabilia and has his own core collection. It all started when Neil was a 6-year old living in the Manchester area. His local shed was 9H Patricroft. He was a regular visitor to the bridge overlooking the depot and he soon developed a rapport with some of the local drivers and firemen. After a while he was given bits and pieces of discarded railway items and some items would appear 'dropped over the rear boundary privet hedge' from the house at the bottom of the garden where Billy Williams, a 9H driver, lived. These items Neil treasured and his interest grew. At the age of 12 he saw a list of railway memorabilia being advertised in a railway magazine. He replied to this advert and in so doing made contact with the well known established collector of that era, the late Mr Paul Carter. In return he was sent his first standard list of 'FOR SALE' railway memorabilia items. In that first list Neil noticed a particular Patricroft smokebox numberplate offered for sale for £7 - off Caprotti Standard 5 No. 73128. So he saved his pocket money (2 shillings a week) and he spent weekends running errands for local neighbours earning 2/6d and then 5 shillings a week for washing 2 TV vans. He did this for several weeks to save up. Having got his £7, he sent a Postal Order off and the numberplate was his! He'd made a start at actually buying! 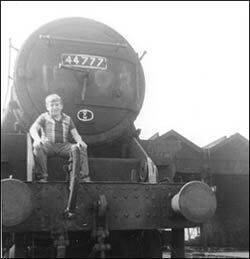 Neil has several pictures of himself (aged 12) taken in 1968 on ex-LMS Stanier Black 5 No. 44777 in scrap line waiting to be sold off. After steam ended at 9H, Neil saw the loco eventually towed away by a class 40. The accompanying picture shows Neil on the buffer beam. He naturally has developed a nostalgic affection for this long lost engine. 37 years later Neil was astounded to be offered the smokebox door of that engine, which had been bought for £10 from Cohens at Kettering in December 1968. Perhaps you, like Neil, have some nostalgic memories of a particular engine, a station, a signalbox or junction or some other piece of railway item or location that you often saw or visited. Maybe you want to be reunited with some items from that past memory. With someone like Neil 'on the regulator', you have located the right business to help you find it. An enthusiast that will help enthusiasts develop their own core collection, or even help them to acquire just single items. As BR changed over to modern traction, so too did Neil's interest broaden. For instance, he saw all the class 50s as they were delivered new from Vulcan Foundry. So he is now equally happy enthusing about, seeking out and displaying railway memorabilia from the modern traction era. RNUK is becoming the UK's recognised leading business for modern traction memorabilia. Neil is keen to encourage the adoption of collection and display themes. Collectors might be interested in particular classes of engines, items connected with a particular station, town or line. A very interesting theme is to focus on the collection of nameplates of, say, a given famous name or event across several generations of steam locomotive and also different generations of modern traction locomotives (see example of "Robert Burns" plates ex-Britannia 70006 & ex-Class 87 87035). To use a well known cliché, within the railway memorabilia world, Neil is one of those people who has been there, done that and got the proverbial T-shirt! And what better way to enhance your own collection, to seek advice on renovation of memorabilia, to seek advice on disposals of items or collections, to get realistic valuations than speak to a practising expert in this particular field. Railwayana Auctions UK is not just a business, it's a professional hobby. Professionally run by someone with a wealth of experience in this field who can understand what collectors and enthusiasts want and above all is enthusiastic about collecting railway memorabilia himself. Throughout Neil's travels, he has met many people and has a great number of contacts. He is able to put on displays using his own core collection and has many offers from his many fellow collector contacts who will lend items from their collections to supplement Neil's own items. 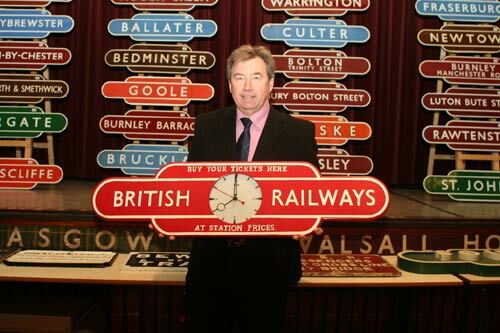 RNUK is pleased to be able to offer to put on impressive displays of railway signs and nameplates for organisers of exhibitions, shows and other events. This venture is known as The Railwayana Roadshow. 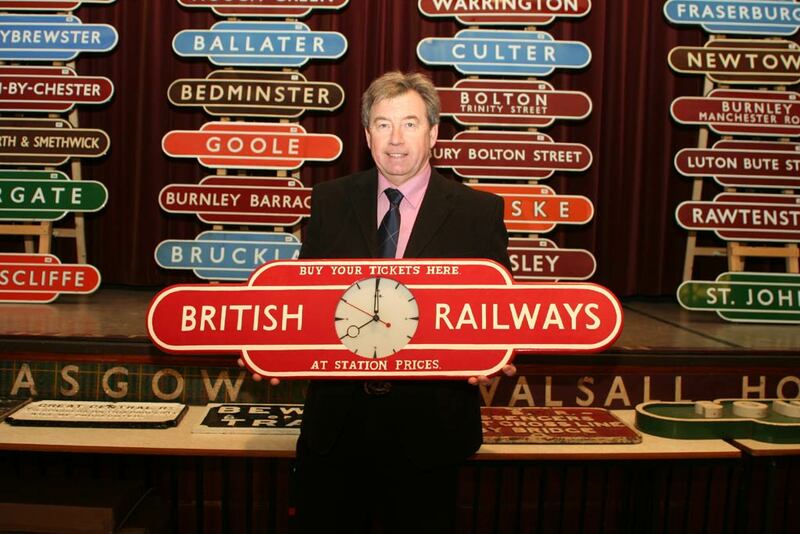 RNUK is an acknowledged and highly respected valuer of railway relics and artefacts. The company is often called upon by leading professional organisations (like the National Railway Museum) and holders of major collections to provide valuations of collections or even single items. In 2006, Neil's activities were strengthened by the introduction of an auction arm via thre creation of sister company, Railwayana Auctions UK Ltd. Since then several very successful auctions have been held at Stafford, which have been notable by the inclusion of some vary rare items, some never seen before or known to have survived. The auctions have attracted significant interest and some notable record 'hammer prices' have been achieved. Neil wishes to thank readers for taking the time to read this profile. 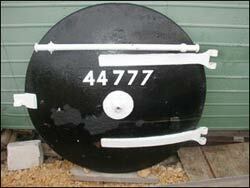 He would be interested to hear of any stories about 9H Patricroft or 44777 (or photographs). Please do not hesitate to ring him or email him (see contact details). As a result of the above article, a website visitor has come forward with the smokebox numberplate of another ex Patricroft locomotive - 73126. Anyone got any other items of "Patricroftana" that Neil might be interested in? Perhaps you have a favourite shed that you would like to collect railwayana from? Let us know.